This afternoon I was sitting at a picnic table relatively clean of bird poop, in a perfect spot in the shade, in the park with my laptop. And not getting a whole lot done. My laptop was running slowly, and I was working on keeping my thoughts running undisturbed by the off-and-on buzzing of the landscaper’s chainsaw across the road. As I paused to gather my thoughts, the creature caught my attention forty feet or so away, hopping from spot to spot to find something edible. There was something about the way he never took a normal step. Every movement was a symmetrical bound, and every run a set of these bounds, his tail flowing behind. I sat back, sipped my coffee and watched the way the squirrel bounded from spot to spot. What I didn’t know was that my laptop battery was about to die, and I was spending my last precious moments watching him and losing out on work time. What I did know was there was something telling in the way he moved and it was fun to watch. And what I know now is it was worth watching no matter my battery life, because it gave me something meaningful to share with you about vision improvement. Was the squirrel aware of his own movements? I don’t think so. He only weighs a pound. It takes so little energy for him to move. His body automatically responds to his thoughts. He thinks of where he wants to move to, and his body springs into action. When he feels threatened, he springs into action in the same way, not consciously controlling his movements but relying on his body to react to his intention. As you may suspect, I’m connecting to this how you move your eyes, and how you learn to move your eyes in an effortless way, free of the tension that is causing your blurry vision. You have a pattern of holding tension in your eyes, but trying to free your eyes of the tension by deliberately moving them around, or in a different way, doesn’t help any more than it would help the squirrel to learn to be more conscious of his bounding gait, trying to feel his muscles working so he can be conscious of what muscles are used. 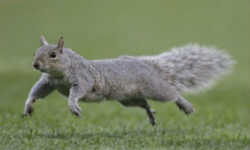 To get better at being a squirrel, including finding food while avoiding predators, the squirrel doesn’t stop and think about his movements and how he might do them better. He doesn’t slow down to try to be hyper-aware of his movements to perfect them according to what another squirrel is telling him. He focuses on his intention, which drags his body along. Top athletes know this too. For MMA fighters, strength training is good, but in the weeks leading up to their performance they taper down their weight lifting to focus more on the important skills, repeating the tasks over and over, focusing not on their muscles but on the intended result, establishing the desired level of performance as a result of creating congruence between their mind, body, and even their emotions. This improves their reaction time, efficiency, and effectiveness. This is why I have put so much emphasis on observing and training yourself mentally. Your eyes are not the problem. They are manifesting the result of your mistakes. The way you perceive and interact with the world around you determines how well you see. Your attitude determines how much tension you will bring into your actions. The way you perceive things determines what you do to try to bring in visual data. We have to adjust your way of perceiving. No amount of exercises will improve your perception if you aren’t willing to change the mental patterns that have made your vision what it is. What have you observed from animals that teaches you a thing or two? Comment below and tell us about it! On the flip side, this could mean that if the mental patterns were corrected and/or eliminated (whatever it is you’re supposed to do) that eye exercises or techniques would not be necessary at all. Are there more adequate ways of doing this than through techniques? Does it vary that much from person to person that some benefit mostly from relaxation techniques and some benefit from looking at it psychologically? What really baffles me still is the anecdotes Dr. Bates mentions time after time of very quick cures happening through a lot of different techniques of his; imagination, flashing, memory, etc. People need examples, and the best examples are what they do themselves. Exercises help people see what happens when you’re forced to try things a little differently. And the bad habits have psychological underpinnings that can suddenly come to light during the practice, as if the exercise itself releases the insight. Underlines the fact that we see things moving, stereoscopic-ally and in perspective, right brain perception… that awakens self awareness. Lost behind glasses and endless hours in front of flat-screens large or small. But Back to squirrels, seeing one drop out of a tree 20 meters high to avoid a predator in 3 deflecting bounces… to a cork oak tree’s branches unforgettable! Nature certainly inspires… stay connected >>> And picking up a dying squirrel out of a road from a car accident the touch of its brush tail. I was impacted like that when I watched a tiny bird swoop down and dart through a hedge bush in front of me once. I stopped, kneeled down and peered through the bush. No way to get through it without changing direction a few times, quicker than you can think. I instantly had a whole new respect for the bird’s capabilities. So many memories of squirrels in my life; my subconscious connected immediately. 2 months / 50 months even 50 years ago wow. David thanks, thinking usually disconnects us. Responsiveness without comment is LIFE, witnessing the mindful interaction of Sight Seeing connects us to the EVER presence. Better vision habits may not be exercises but practice fast tracks the restorative process. Regards all global readers. thanks again David from Cape Town. so very true. Our brain is similar to a locomotive, just an engine pulling all our body organs behind…. Energy follows thought, Tom Quackenbush used to say. thanks for the squirrel connection, I find Nature is our greatest teacher. All the best. p.s. : Marie Schils from Belgium is giving a workshop on “our thoughts and our eyesight” at our October Congress. In French, I’m afraid! Love this, David. Thanks. Peter Grunwald (founder of Eyebody) taught us “Intention leads, eyes and body follow”. He was definitely on to something! Previous Previous post: Are You Straining Your Eyes? Stop It!